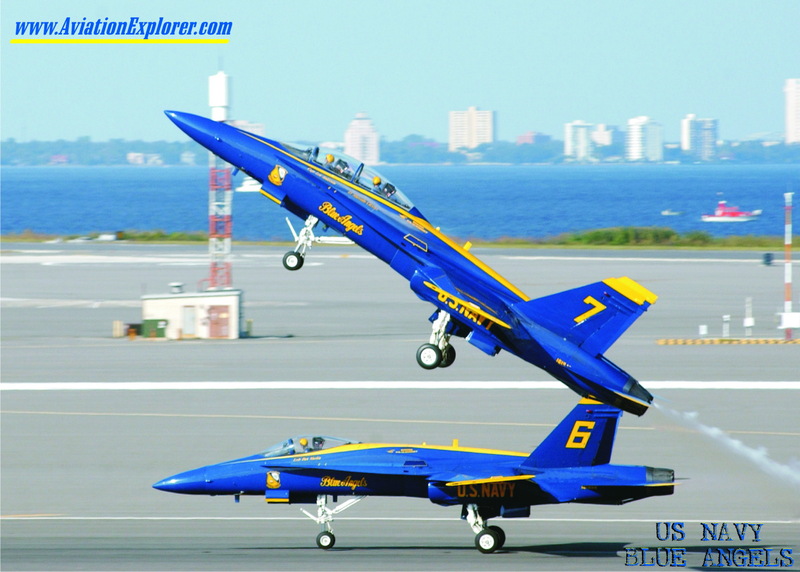 The United States Navy's Navy Flight Demonstration Squadron, popularly known as the Blue Angels, first performed in 1946 and was the world's first officially sanctioned military aerial demonstration team. The squadron's six demonstration pilots fly the Boeing FA-18 Hornet in more than 70 shows at 34 locations throughout the United States each year, where they still employ many of the same practices and techniques used in their aerial displays in 1946. Since their inception, the "Blues" have flown a variety of different aircraft types for more than 427 million spectators worldwide. The Blue Angels show season runs each year from March until November. 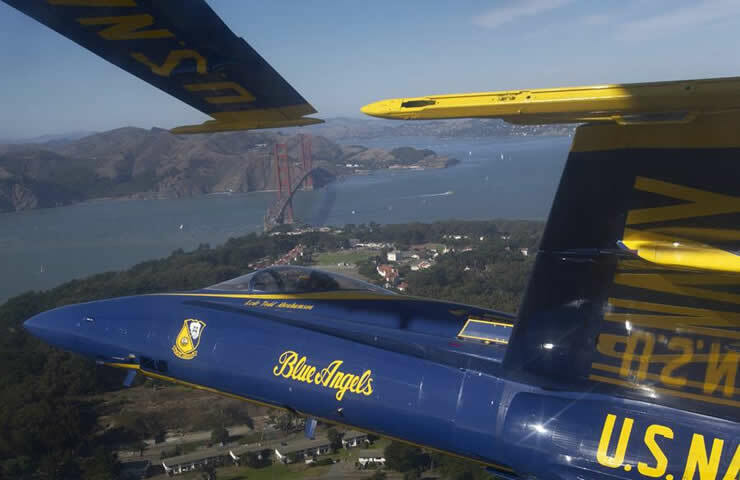 They perform at military and civilian airfields, and often perform directly over major cities such as San Francisco and Seattle during "Fleet Week" maritime festivals. 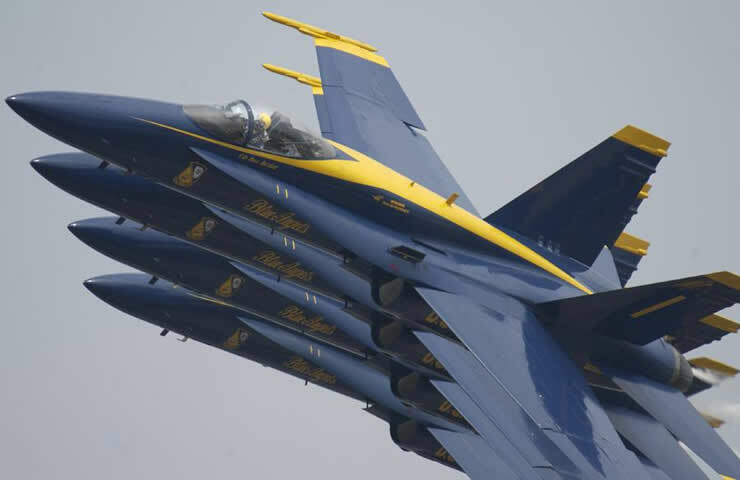 During the aerobatic demonstration, the Blue Angels operate six FA-18 Hornet aircraft, split into the Diamond (Blue Angels 1 through 4) and the Lead and Opposing Solos (Blue Angels 5 and 6). Most of the show alternates between maneuvers performed by the Diamond and those performed by the Solos. The Diamond, in tight formation and usually at lower speeds, performs maneuvers such as formation loops, barrel rolls, and transitions from one formation to another. The Solos fly many of their maneuvers just under the speed of sound, showcasing the high performance capabilities of their individual Hornets through the execution of high-speed passes, slow passes, fast rolls, slow rolls, and very tight turns. Some of the maneuvers include both solo F/A-18s performing at once, such as opposing passes (toward each other in what appears to be a collision course) and mirror formations (back-to-back. belly-to-belly, or wingtip-to-wingtip, with one jet flying inverted). The Solos join the Diamond near the end of the show for a number of maneuvers in the Delta formation. The parameters of each show must be tailored to local weather: in clear weather the "high" show is performed; in overcast conditions a "low" show is performed, and in limited visibility (weather permitting) the "flat" show is presented. The "high" show requires an 8,000-foot (2,400 m) ceiling and visibility of 3 nautical miles (6 km) from the show's centerpoint. "Low" and "flat" ceilings are 3,500 and 1,500 feet (460 m) respectively. When initially formed, the unit was called the Navy Flight Exhibition Team. 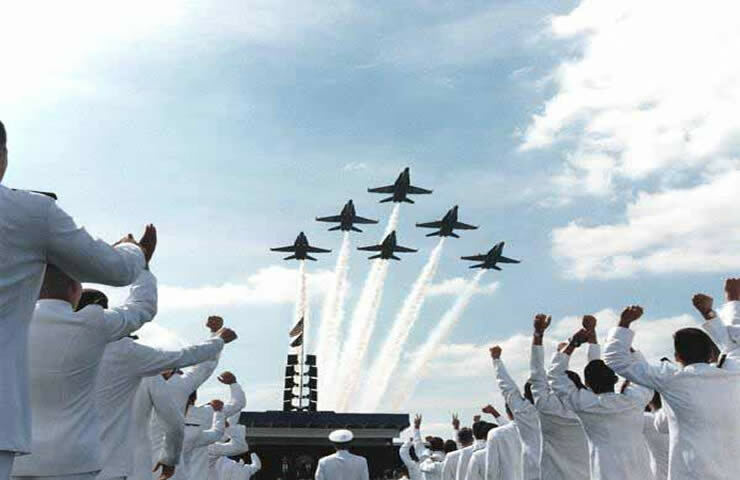 The squadron was officially redesignated as the United States Navy Flight Demonstration Squadron in December 1974. 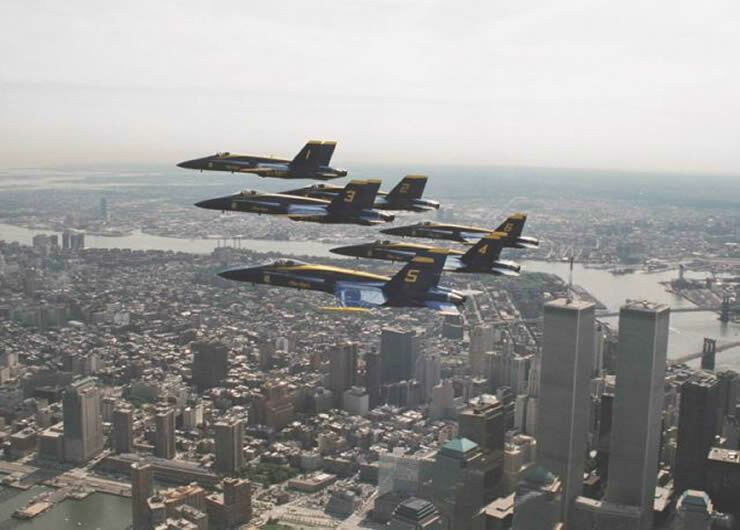 The original team adopted the nickname Blue Angels in 1946, when one of them came across the name of New York City's Blue Angel nightclub in the New Yorker Magazine. 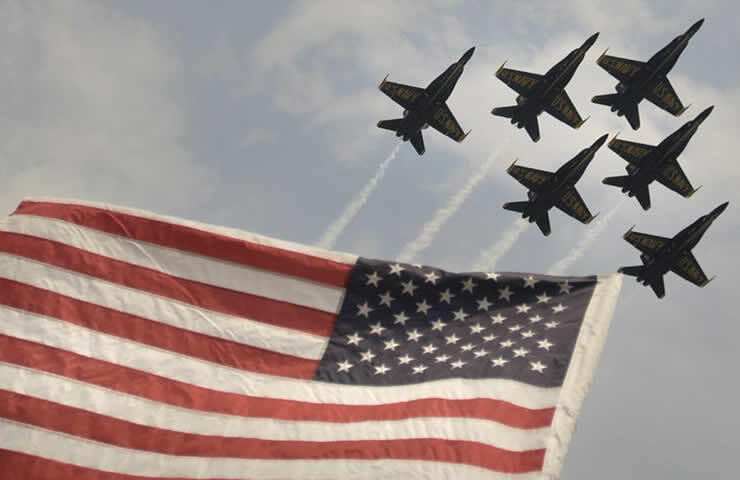 The team introduced themselves as the "Blue Angels" to the public for the first time on July 21 1946 in Omaha, Nebraska. The official Blue Angels insignia was designed by then team leader Lt. Cmdr. R.E. "Dusty" Rhodes and approved by CNO in 1949. It is nearly identical to the current design. In the cloud in the upper right quadrant, the aircraft were originally shown heading down and to the right. Over the years, the plane silhouettes have changed along with the squadron's aircraft. Additionally, the lower left quadrant, which contains the Chief of Naval Air Training insignia, has occasionally contained only Naval Aviator wings. Originally, demonstration aircraft were navy blue (nearly black) with gold lettering. The current shades of blue and yellow were adopted when the team transitioned to the Bearcat in 1946. For a single year in 1949, the team performed in a blinding all-yellow scheme with blue markings. The current paint scheme, including yellow stripe markings along the top of the fuselage, and "U.S. Navy" on the bottom of the wings, was designed by team member Robert L. Rasmussen in 1957. The "Blues" FA-18 aircraft are former fleet aircraft that are nearly combat-ready. They can be repainted and readied for combat service in just 72 hours. Significant modifications to each aircraft include removal of the aircraft gun and replacement with the tank that contains the paraffin-based smoked oil used in demonstrations, installation of inverted fuel pumps to increase the time aircraft can spend inverted without fuel starvation, and outfitting with the control stick spring system that is used to facilitate more precise aircraft control inputs. The standard demonstration configuration is such that the pilot must overcome 40 pounds of nose-down stick input to maintain level flight. 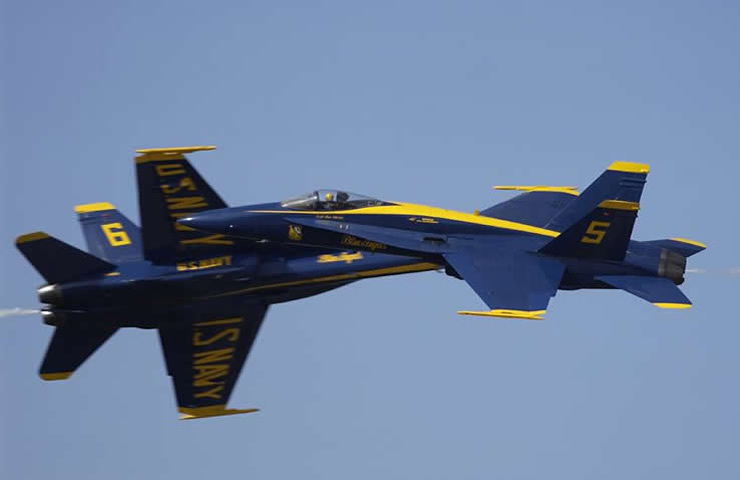 The Blue Angels do not wear G-suits, because the air bladders inside them would repeatedly deflate and inflate. That would interfere with the control stick between a pilot's legs. 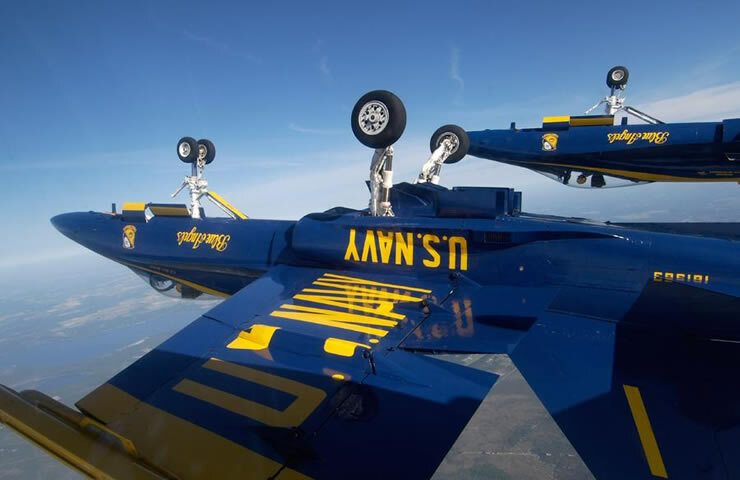 Instead, Blue Angel pilots tense their stomach muscles and legs to prevent blood from rushing from their heads and rendering them unconscious. 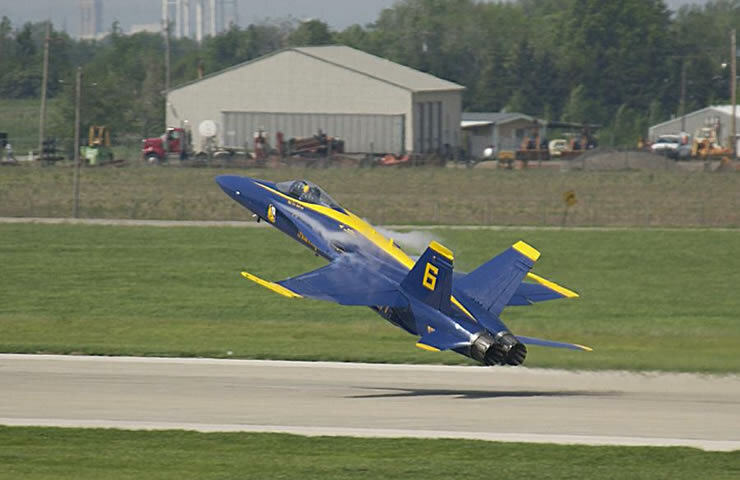 The show narrator flies Blue Angel 7—a two-seat FA-18B—to shows sites. The Blue Angles use this plane for backup, and to give demonstration flights to civilians (usually members of the press). The #4 slot pilot often flies the #7 aircraft in Friday "practice" shows. 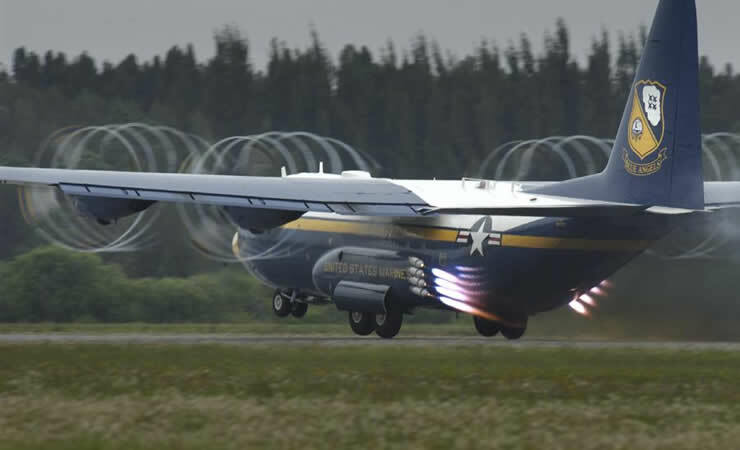 The Blue Angels use a United States Marine Corps C-130T Hercules nicknamed "Fat Albert" for logistics, carrying spare parts, equipment, and to carry support personnel between shows. They also use "Bert" for a short aerial demonstration just prior to the jet demonstration at selected venues. "Fat Albert Airlines" flies with an all-Marine crew of three officers and five enlisted personnel. All team members, both officer and enlisted, come from the ranks of regular Navy and United States Marine Corps units. The demonstration pilots and narrator are made up of Navy and USMC Naval Aviators. Pilots typically serve two years, and position assignments are made according to team needs, pilot experience levels, and career considerations for members. The team leader (#1) is the Commanding Officer and is always a Navy Commander or Captain. Pilots of numbers 2-7 are Navy Lieutenants or Lieutenant Commanders. There is usually one Marine among this group, a Captain/Major. The number 7 pilot narrates for a year, and then typically flies Opposing and then Lead Solo the following two years. It is not uncommon for the numbers 3 pilot to move to the number 4 (slot) position for his second year. 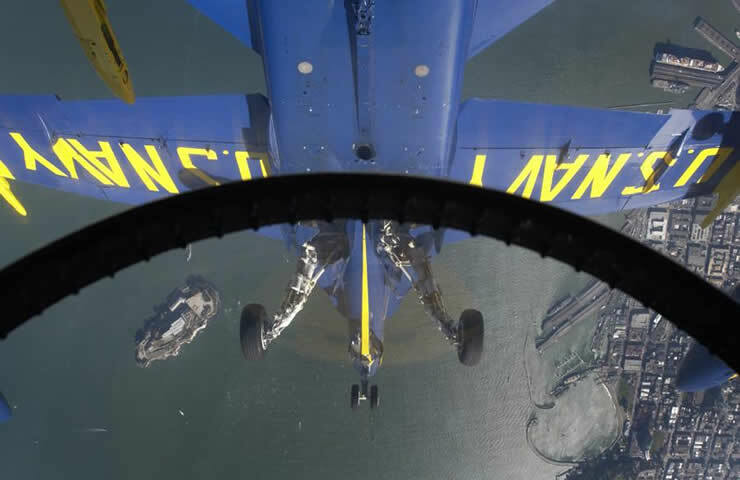 Blue Angel #4 serves as the demonstration safety officer, due largely to the perspective he is afforded from the slot position within the formation, as well as his status as a second-year demonstration pilot. There are a number of other officers in the squadron, including a Naval Flight Officer, the USMC C-130 pilots, a Maintenance Officer, an Administrative Officer, and a Flight Surgeon. Enlisted members range from E-4 to E-9, and perform all maintenance, administrative, and support functions. After serving with the "Blues", members return to fleet assignments. Annual winter training takes place at NAF El Centro, CA, where new and returning pilots hone skills learned in the fleet. Separation between the formation of aircraft and their maneuver altitude is gradually reduced over the course of about two months in January and February. The team returns to their home base of Pensacola, Florida in March, and continue to practice throughout the show season. A typical week during the season has practices at NAS Pensacola on Tuesday and Wednesday mornings. Then team then flies to its show venue for the week on Thursday, conducting "circle and arrival" orientation maneuvers upon arrival. The team flies a "practice" airshow at the show site on Friday. This show is attended by invited guests but is often open to the general public. The main airshows are conducted on Saturdays and Sundays, with the team returning home on Sunday evenings. Mondays are the only routine day off. In 2006, the Blue Angels marked their 60th year of performing. On October 30, 2008 a spokesman for the team announced that the team would complete its last three performances of the year with five jets instead of six. The change was because one pilot and another officer in the organization had been removed from duty for engaging in an "inappropriate relationship". The Navy stated that one of the individuals was a man and the other a woman, one a Marine and the other from the Navy, and that Rear Admiral Mark Guadagnini, chief of Naval air training, was reviewing the situation. At the next performance at Lackland Air Force Base following the announcement the #4 or slot pilot, was absent from the formation. A spokesman for the team would not confirm the identity of the pilot removed from the team. On November 6, 2008 both officers were found guilty at an admirals mast on unspecified charges but the resulting punishment was not disclosed. The "Blues" have flown nine different demonstration aircraft and five support aircraft models. McDonnell Douglas (now Boeing) F/A-18A/B Hornet - November 1986-Present. They are currently switching to the F/A-18C/D. Double Farvel: Diamond formation with aircraft 1 and 4 inverted. Line-Abreast Loop – the most difficult formation maneuver to do well. Note, the maneuver sequence has changed in 2008 from what it was in 2007.